The turn of the nineteenth century saw a change in the perception of woman's nature. 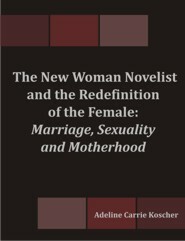 Trying to salvage a female self-identity from the distorted version of the preceding Victorian era, New Woman novelists attempted to tease out of a morass of social dictates of femininity a genuine female nature. In their novels they wrote New Woman heroines who, like themselves, faced the conundrum of discerning the truth from the fallacy of what society proposed as their identity and social role. This awareness for neither novelists nor heroines was the complete solution to their social problem. The New Woman novelist challenged on terrain that was both within her jurisdiction and familiar to her. What she found there was simultaneously and profoundly oppressive: the Victorian institutions of marriage, sexuality and motherhood. Marriage required exhaustive reform before New Woman novelists would encourage participation in it. These novelists blindly probed woman's elusive sexuality, attempting to determine her archetypal, sexual nature, asserting that exposure to this nature by a man would be life-altering and would save the world, no less. Like sexuality, motherhood was an institution in which the New Woman novelist found power, and she aspired to manipulate the small power she saw dormant in this patriarchal institution. The New Woman sought partnership and fellowship with a suitable male who valued her companionship - one who was enlightened or who was willing to be. Confronting the reality of the dearth of such potential partners had devastating effects connected with a devouring sense of solitude. Despite the growing number of New Women in society, the awareness of a self distinct from the former social mores proved to be isolating. An intense loneliness became the next and ultimate oppressor of the enlightened New Woman who lived for ideals beyond her grasp and who was hampered by the constraints of a society slow to make the changes she required for survival.